The benefits of using micrococcal nuclease to digest chromatin compared to sonication. SimpleChIP® Kits and Antibodies validated in-house by our antibody development scientists correlated to positive and negative control primers. Use SimpleChIP kits to perform high throughput ChIP-Sequencing and assay genome wide changes in histone modifications and transcription factor binding. Overview of epigenetic and chromatin regulation pathways, antibodies and related reagents, interactive pathway diagrams, and technical resources for epigenetics research. Detailed technical support information to support ChIP experimental success. LInk to CST's comprehensive ChIP protocol. Chromatin Immunoprecipitation Troubleshooting Guide: easy to follow directions describing the step by step experimental procedure. Chromatin IP (ChIP) Frequently Asked Questions (FAQs) from Cell Signaling Technology, Inc.
In-cell Western: a simple method for quantification of intracellular signaling in whole cells. Data and links for tech support. 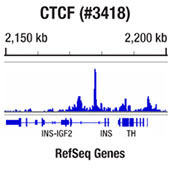 The chromatin immunoprecipitation (ChIP) assay is a powerful and versatile technique to probe protein-DNA interactions within the natural chromatin context of the cell. Assay Kits from CST contain ChIP validated antibodies and control PCR primers to assay for pluripotency markers or epigenetic mark status in human or mouse samples. SimpleChIP® Chromatin Immunoprecipitation Protocol (Agarose Beads): easy to follow directions describing the step by step experimental procedure. SimpleChIP® Chromatin Immunoprecipitation Protocol (Magnetic Beads): easy to follow directions describing the step by step experimental procedure. CST provides multiple options for avoiding the problems of traditional sonication protocols, which require subjecting chromatin to harsh, denaturing conditions that can damage both antibody epitopes and the integrity of the chromatin. SimpleChIP® Plus Chromatin Immunoprecipitation Protocol (Magnetic Beads): easy to follow directions describing the step by step experimental procedure.